As we discussed earlier about the latest Microsoft event held on 29th of this month, we are here with a quick hands-on review of one of the best Windows Phone 8 to be seen- The SAMSUNG ATIV S.
This Windows Phone 8 got officially unveiled at the Microsoft event in San Francisco. It is the third Windows Phone 8 device in the family. It did leave quite a good impression, being a bit larger than the Nokia and HTC Windows Phone 8 devices. One of the first things you would notice about the phone is- the Central Physical Home Button which is designed with the newest Microsoft's logo over it. It is also used to wake the phone up. The phone is quite light-weighted and slim-bodied and has been given more of a metallic aluminium finish. There are four physical keys on the phone — a power key/lock key, a dedicated camera key, a volume rocker and on the front a home key (alongside touch-keys: back and Bing search, to make up the standard Windows Phone trio of nav keys). The ATIV S sports a bright 4.8 inch-ed HD Super AMOLED Display having a resolution of 1280 x 720 pixels. It is powered by a 1.5 GHz dual-core Qualcomm Snapdragon S4 processor bundled up with 1 GB of RAM and 16 GB/ 32 GB of onboard storage. 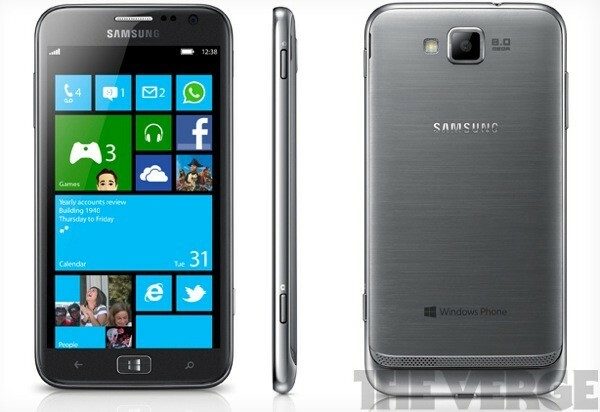 There will also be a microSD slot for further memory expansion and also the SkyDrive feature. The smartphone is equipped with an enormous 2,300 mAh hour battery giving the device an excellent battery standby time. Much to our expectations, it will also support the 4G LTE networks, Wi-Fi, Bluetooth, NFC and so on. Not to forget, it has a 8 MP Snapper on its back and a 1.3 MP Front facing camera for all your skyp-ing. Samsung has added a few new apps of its own in order to differentiate it selves from other Windows Phone 8 devices. The list of apps include a WhatsApp-style messaging app called ChatOn, a journal app called Mini Diary, a news aggregator called Now and an NFC wallet app. Samsung would also be preloading some of its own lenses (i.e. filters) on the camera app, though we did not get a look at it during our hands on review. No US carrier announcements have been made for this device yet. We can safely declare that this Windows Phone 8 device is for the European and other markets. We will keep you updated with the latest updates. Keep reading. 0 Respones to "SAMSUNG ATIV S SMARTPHONE HANDS-ON"